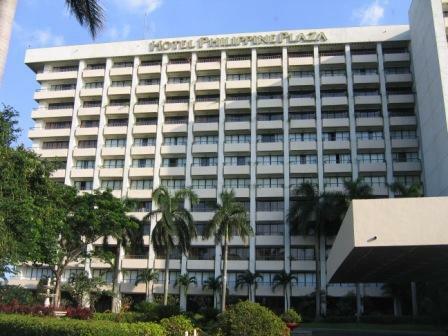 Here are some photos I have taken of the Sofitel Philippines Plaza Manila when it was the Westin Plaza Manila. It is now managed by the Accor group and has the 5 star branding of Sofitel. When these photos were taken the hotel was undergoing refurbishment as the property was getting a little tired and in need of a some tender love and care. So there are no photos of the foyer and reception, but I have been informed that they are both fairly impressive and that the refurbishment was worth the inconvenience. Accor are now slowly completing the upgrade to the rooms, i look forward to seing them on my next visit. If you have any recent photos let me know becaise i would love to see them, you can contact me here. As you first enter the Sofitel Philippines Plaza you drive up the driveway, no surprises there I guess, to the front foyer. Here the valet will take your luggage for you before having your car parked underneath the hotel. Note that it is all undercover, you just never know what the Manila weather will toss at you. I probably should have put this photo first since you have to get past the security before you get to the hotel. 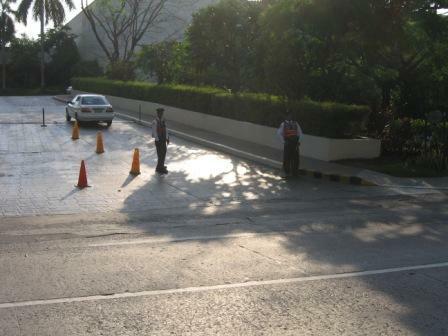 Each vehicle that enters the hotel grounds must pass through this check-point, where the security guards give your vehicle a cursory glance. Interestingly enough they had mirrors on the end of sticks looking for bombs under the vehicle, whilst I was watching if there was anything under the cars it was safe from detection, there was no way they would have found it! 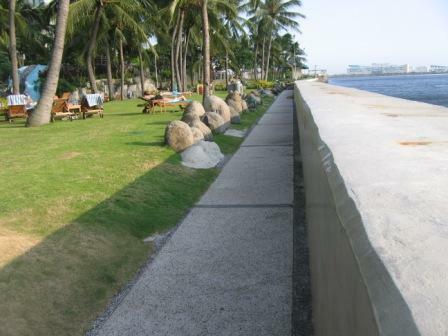 On the Manila Bay side of the hotel you have lovely manicured lawns facing west. This is the best place to view the famous Manila Sunset. the actual grounds a re beautiful with mature palm trees litering the lawn and no sand to between your toes, a resort made in heaven. 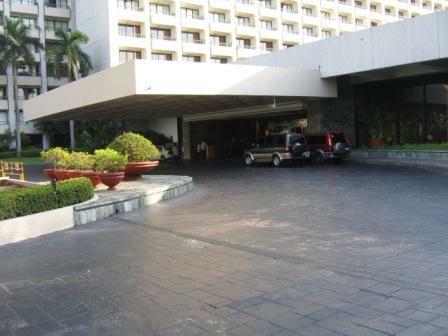 The Sofitel Manila is a huge 5 star resort with over 600 rooms. It was built in the mid 70's and was getting a bit tired, but it is now just a bout finishing a complete refurbishment by the new managers, Accor. This photo was taken prior to the Sofitel branding. 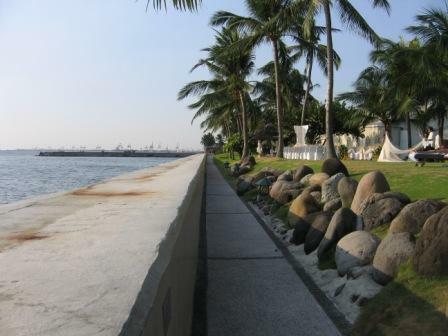 On the grass facing Manila Bay is a popular area for your couples. It is the ideal area to get married. A huge marquee, which you can see in the photo behind the chairs, is used for weddings, the bridal photos would look pretty impressive with the Manila sunset as a backdrop. If you want peace and quiet in Manila, I know it is hard to imagine, but if you do and you don't mind traveling a little further to get to the malls, then you should try the Sofitel Philippines Plaza Manila. The only resort in Manila.